Turning your WordPress site into a community with BuddyPress has never been easier thanks to improvements in recent versions of the social networking plugin. 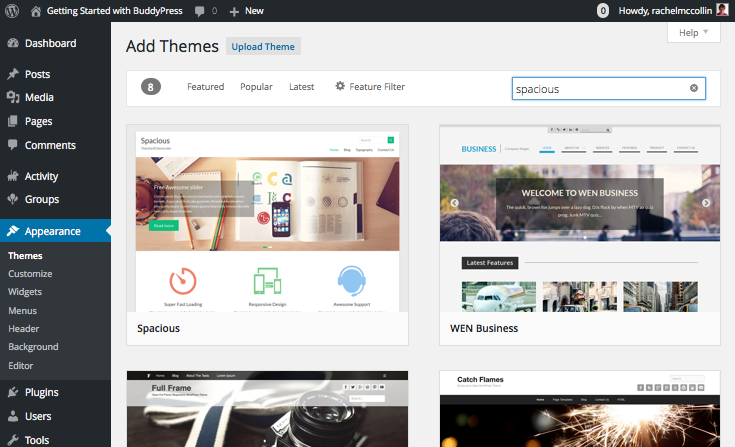 BuddyPress works great with a huge number of free and premium themes, and the BuddyPress components look great in responsive themes too. If you’d like to turn your site into a community of users and add social media features, then the free BuddyPress plugin makes it possible. In this post, I’ll show you how to install and configure BuddyPress on your site. You’ll learn how to create pages for BuddyPress, to add these to your menu and widgets, and to test your site using test data. If you want to learn all about BuddyPress before you start, then the dedicated BuddyPress site is a great place to go, and we also have plenty of BuddyPress guides here on WPMU DEV. But for me the best way to learn anything is by having a bash at it, so let’s get started! 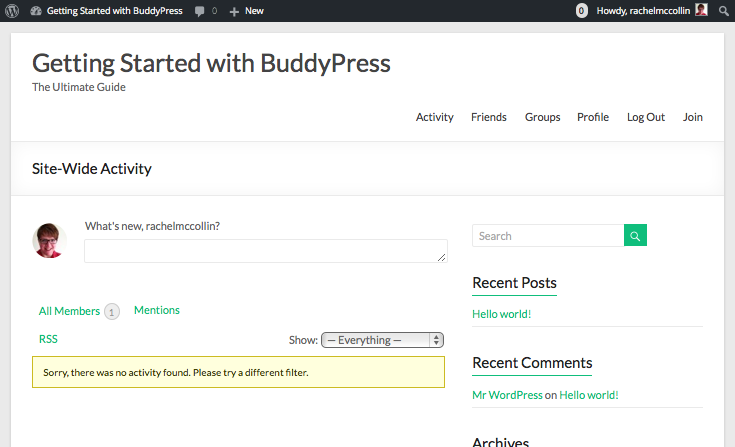 BuddyPress helps you run any kind of social network on your WordPress site. The first thing you’ll need to do is install the BuddyPress plugin. I’m going to install it on a fresh WordPress installation, but you can also install it on an existing site. In your WordPress admin screens, go to Plugins > Add New, and you’ll see BuddyPress displayed prominently in the list of available plugins. Click the Install button followed by the Activate plugin link, and BuddyPress will be installed for you. Here you’ll find various links to help you set up and manage your BuddyPress community. Start by configuring settings for BuddyPress. Selecting the components you want to include. The place to start is by selecting components, as that will have a knock-on effect on the other settings. To choose the components you’ll be using, either click the Set Up Components link in the welcome screen or go to Settings > BuddyPress and select the Components tab. Site Tracking: track what’s happening on your site (posts and comments). BuddyPress Core: you can’t deselect this component as without it, BuddyPress won’t work! Community Members: again you can’t deselect this as BuddyPress won’t function without members. You can select as many or as few of these as are relevant for your site, and add to them at a later date if you decide to extend your community’s scope. I’m going to select all of the components (maybe because I’m greedy, or more likely because I want to demonstrate them all here). Check all the boxes you need for your site and click the Save Settings button. The next step is to configure the pages that BuddyPress will use. Before moving on to the Pages tab, however, you’ll need to create a couple of pages: for registration and activation. Note: If your community is closed and people can’t register themselves (i.e. you’ll be adding all of the users manually), you can skip this step. 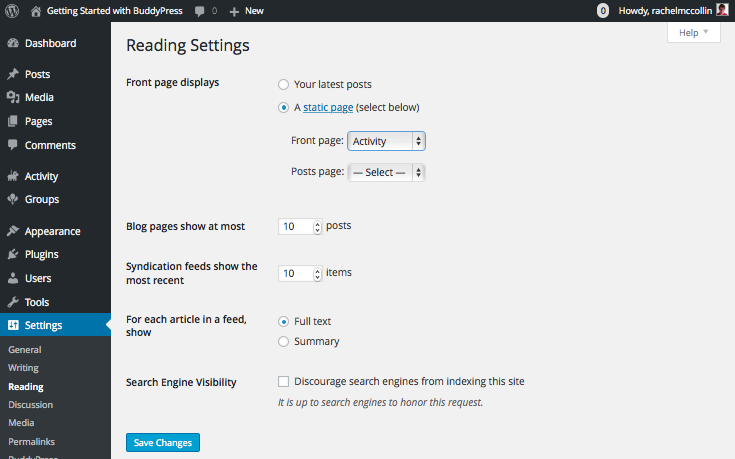 In your WordPress admin, go to Pages > Add New, and create the two pages as you normally would. Call one Registration and the Other Activation (or something different but meaningful to you and your users). Once you’ve done that, you’ll see all of the pages in your site so far in the main Pages listing screen. BuddyPress has already added two more pages for you: Activity and Members. I’ve deleted the default ‘Sample Page’ that WordPress creates so I now have four pages in total. Now you have your pages in place, you can configure them for BuddyPress. Go back to Settings > BuddyPress and click the Pages tab. Click the Save Settings button. BuddyPress will automatically use those pages to display the appropriate content in your site. 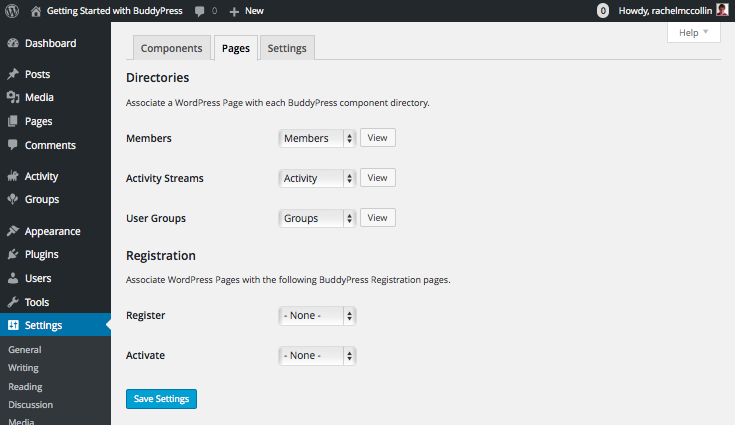 Now that you’ve selected components and created pages, it’s time to move on to configure BuddyPress settings. Main Settings: enable or disable the toolbar at the top of the screen for logged-in users, and specify whether users can delete their account themselves. Profile Settings: allow members to upload their own profile picture, and sync BuddyPress and WordPress profiles. Groups Settings: let users create groups, and choose whether to allow customization of group avatars. Activity Settings: enable activity stream commenting on blog and forum posts as well as BuddyPress updates, and auto-referees the activity stream in real time. Select the ones that are relevant to your site and click the Save Settings button. I’m selecting everything (being greedy again!). Now that you’ve got BuddyPress set up, it’s a good idea to configure your WordPress settings before moving on to adding your navigation menu and widgets. Permalinks: make sure pretty permalinks are turned on. Reading: set this so that the home page is a static page, namely the Activity page. This will ensure that when your users open your site, they see recent activity. I’m leaving the Posts page option blank as my site doesn’t have a blog: if yours does, select the appropriate page. Note: If you’re adding BuddyPress to an established site and want to keep your existing home page, you might choose not to have the activity page as your home page. But make sure your Activity page is nice and easy for people to find. Change the settings on those two screens and click Save Changes for each. Now you need a theme for your site. If you’re working with an existing site you can skip this bit as the chances are you’re happy with your existing theme. A few years ago, you could only use a BuddyPress-compatible theme if you wanted to run BuddyPress, and if you wanted to use the plugin with your own theme, you’d have to add some extra theme template files to make BuddyPress work. If you’ve been told that you still have to do this, don’t worry: you don’t. Since version 1.7, BuddyPress will work with any well-written theme, although there will always be some themes whose layout and design suit BuddyPress better than others. I’m going to use a theme called Spacious, which is free with a clean design that doesn’t detract from the myriad of content your users will generate and has customization options that mean you can tweak the design. 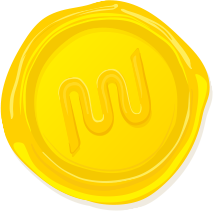 Click the Install button followed by the Activate link to install and activate the theme. If you’d like to customize the theme, you can do so via the theme settings screen or the customizer. Next let’s add a menu and some widgets to the site to improve navigation. If your site doesn’t already have a navigation menu you’ll need to create one and assign it to the primary slot in your theme. Go to Appearance > Menus and click the create a new menu link. Name your menu, check the Primary Navigation checkbox and save it. If you can’t see a section called BuddyPress on the left hand side, with all of the BuddyPress pages listed, you can turn it on by opening the Screen Options tab at the top of the screen and checking BuddyPress. All of these apart from the last one are taken from the BuddyPress list on the left: the Registration link is taken from the Pages list. I’ve changed the link text for Registration to Join, to make it more direct. Next I want to add some widgets to display activity and help users navigate around the site. I’m going to add widgets to my sidebar and header widget areas, plus the four footer widget areas. If you’re using a different theme you’ll probably have different widget areas. Also the widgets you have available to use will depend on the components you activated at the beginning. Add the Search widget to the header widget area, if your theme has one. If not, it’s a good idea to add it to the sidebar. Finally, add a text widget to the fourth footer widget area, with some explanatory text about the community and a link to the registration page. At the moment it’s very empty. Hopefully as my community grows, my members will add content to it over time and it will start to look fuller, but in the meantime I’m going to add some dummy data to test the site. Before you launch your BuddyPress community, especially if you’re making it available to the general public or charging for membership, it’s a good idea to test it with some dummy data. You can use the BuddyPress Default Data plugin to import dummy data to your site and add content to all of the BuddyPress screens so you can test things out. Once you’re happy with your site, you can then use the plugin’s settings to delete all of the dummy content so your users won’t see it. Go to Plugins > Add New and install the BuddyPress Default Data plugin in the normal way. Import Users: check this or your site will have no dummy users for testing. Import user profile data: check this, as the core components include profile data. Create friend connections: check this if you enabled the Friend Connections component. Import activity posts: check this is you enabled the Activity Streams component. Import groups: check all of these options of you’ve enabled the User groups component. Click on Import Selected Data and the plugin will import dummy data for you. Once you’ve tested all the screens in your site and you’re happy everything works, you can delete the test data by going back to the plugin’s screen in the Tools menu and clicking the Clear BuddyPress Data button. Now that your site is up and running, the next step is to promote it and encourage people to join. What you’ll need to do will depend on the nature of your community: if your site is for a small, already established group or team that shouldn’t be too hard; if it serves an existing community you’ll have to spread the word and encourage others too; and if you’re looking for a wider audience and/or selling membership, you’ll need a robust marketing plan. Keeping your site up to date, including WordPress, the BuddyPress plugin, your theme and any other plugins you have installed. Testing the site when updating to ensure no problems arise (it’s good idea to test updates on a development or staging version of your site first to be safe). Keeping regular backups with a plugin like Snapshot Pro. If necessary, moderating the community and resolving any complaints or disputes. As your community grows, moderation is likely to become more important. It’s a good idea to define some community standards or guidelines right at the start and create a page for these on your site, so people know what’s expected. These will include guidelines about spam, trolling, use of profanity, personal attacks, spammy links, uploads and more. What you include will depend on you and your community, and may evolve over time. As the administrator you can delete a user’s account if they breach the community guidelines, but it’s best to delete specific posts or interactions first if they’re inappropriate and/or contact the user about it. You’ll have to find a balance between preventing unacceptable behaviour and being heavy-handed – if you’ve been following the rise of Facebook and twitter, you;’ll know how hard this can be! Repair user “last activity” data. Use these tools only when necessary however, as they put some strain on the database. It’s best to put the site into maintenance mode first and take a backup! BuddyPress is a powerful tool for creating online communities, which you can use for anything from a small team to a massive network of people across the world. It has the flexibility to accommodate a variety of uses, because you can switch components and settings on and off according to the needs of your site. In this post you’ve learned how to install and configure BuddyPress, add BuddyPress pages to your navigation menu, insert BuddyPress widgets into your theme’s widget areas, and use dummy data to test your community. Now that your site is up and running, all that remains is for you to encourage people to join, and to start a conversation with them. Enjoy! What do you use BuddyPress for? How does it enhance your community? Add your experiences in the comments below. this is really deep tutorial.. very well writen.. in fuure this might help me a lot..
Great write up. I really love it and it was very helpful. I’m looking for a WordPress plugin that will track the date of birth people fill in when registering to my site and send people with same date of births friend suggestions. Do you have any idea how I can achieve that ? I have the members listed on Group Pages, but I want to be able to list members on a Team Page, but only certain members not all. I followed the above info and everything came out perfect accept there is no place for people to join. I logged out and wanted to see if I could join with a different email address but I could do anything, there was a message that reads: User registration is currently not allowed. Thanks so much, Rachel! Another great tutorial from WPMU Dev! I was familiar with most of it but it’s a great reference and I’ve bookmarked it (twice!) for future reference. In particular, you’ve solve a headache I was having creating a link to the profile page as the BuddyPress pages do not appear in my Admin section menu settings page, for some reason – I hadn’t thought of using the Customise link at the top as it’s slower. Hi great article, I’m wondering if you might be able to recommend any free plug ins I can use to dress BP up a bit visually. It is truly awesome but I feel like its a little lacking in flash. Oh and thanks, my BP is finally set up right thanks to you. The Buddypress Guides links gives a 404. Can you please correct that? BuddyPress helps me to convert my wordpress website to forum website thanks for this guide to convert my website to forum. I have a site thats uses buddypress profiles for log in information (profiles). I must use this because we are passing the information from the profile into salesforce. The site has been well received and now different companies want to privatize the content into their company. I’d like to be able to achieve that using WPMU but my understanding is that buddypress shares all user data across all sites in the networks of sites. Is that the case and if so do you now a way around it? Multisite has just one table (well two actually, one for user data and one for user metadata but you don’t need to worry about that) for users across the whole network. This means that user data is stored for the network, not the individual site. There’s no way to chnage this, it’s a fundamental part of how MS works. However it stores details of which sites each user is registered to, and the admins of sites a user isn’t registered to can’t see any of that user’s details. I don’t know how that would work with salesforce integration though as I haven’t used that. Hope that helps. Very good tutorial.I got a lot from this.